OAuth is a handshake mechanism where, instead of asking for personal information, Liferay DXP redirects users to a service provider like Twitter, where they can tell Twitter to allow Liferay DXP limited access to their accounts. This example is similar to our earlier “valet key” characterization. You wouldn’t want a valet driver opening your glove box, storage spaces, hood, and other personal compartments in your vehicle. You would only want the valet to access what is necessary to park your car. OAuth is based on this same idea: it gives a site just enough information to do what it needs and nothing more. This assures users that their personal information is safe, but gives them freedom to take advantage of valuable resources they typically use from the service provider’s site. Access Level: select the Read or Write access level. For the Read access level, the user can only view the application’s contents, but not modify them. The Write access level gives the user permission to access and modify the application’s contents. After you’re finished registering the OAuth app, click Actions → View. 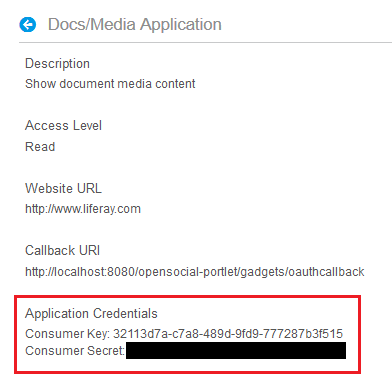 You’ll notice Liferay DXP generated two Application Credentials: the Consumer Key and Consumer Secret. The consumer key is a value used by the application to identify itself to the service provider. Likewise, the consumer secret is a value the application uses to establish ownership of the consumer key. Figure 14.x: You’ll need the application credentials to implement OAuth in your application. Take note of your application credentials; you’ll need them when configuring your application with OAuth. To learn how to configure an application with OAuth, visit the Authorizing Access to Services with OAuth (not yet written) tutorial. Once you have your application configured to use OAuth, visit the next section to begin authorizing requests via OAuth. Once you have your application configured to use OAuth, you can place your application on a page and test out the process. Here is a basic synopsis of what’s happening during the authorization process. The app that you registered in the previous section and configured with the consumer key and secret by following the developer tutorial is characterized as a service provider. The service provider uses OAuth to allow users access to its protected resources. These protected resources are data controlled by the service provider, which can only be accessed by the application through authentication. By configuring an application in Liferay DXP to use OAuth, you’re keeping all private information you have between a third-party service provider and the portal separate. Essentially, OAuth bridges the connection between the portal and third-party services without the user sharing any protected resources between them. Once your OAuth application is placed on a portal page, you’ll be asked to grant or deny the third-party service provider limited access to your portal. Figure 14.38: You can grant or deny the service provider access to your. Congratulations! You’ve successfully installed your OAuth app and authorized access between a service provider and Liferay DXP!